As a global community, we are under increasing pressure to accelerate the development of new technologies that will combat climate change and deadly air pollution. Transitioning our economies away from fossil fuel will have a significant impact on these issues. However, if we don’t collaborate on technological advancements, we’ll continue to face the consequences of global climate change and air pollution-related health issues. Collaboration among organizations, leaders, jurisdictions, and experts always leads to higher levels of collective creativity and increased innovation. It enables us to approach challenges from different perspectives and find better solutions. Hydrogen technology is a viable and proven solution to solve the zero emission challenges we collectively face. However, in order to continue to move the hydrogen economy into the mainstream at much lower costs, increased collaboration is essential. The transportation sector, already on the cusp of change, is ready to embrace collaboration - this is especially true for the fuel cell manufacturers and adopters of this technology. Those in the transport and energy industries are starting to share ideas and processes to achieve this goal. Collaboration on fuel cell system commonality will lead to significant improvements and is essential to overcoming cost challenges related to deploying fuel cell technology. Additionally, integration within the fuel cell industry will assist with market growth and lower costs through increased benefits from economies of scale. Collaboration can also have other emergent benefits, such as mergers and acquisitions within the fuel cell industry. These create a scenario where capital is pooled and larger projects become feasible. Research is also shared, which leads to increased innovation and improved technology. Mergers within the fuel cell industry will serve as a way to exploit the best technology and reach commercial cost targets. Inspiring collaborations are already taking place all over the world. Europe, in particular, is one of the key players leading this technology revolution. 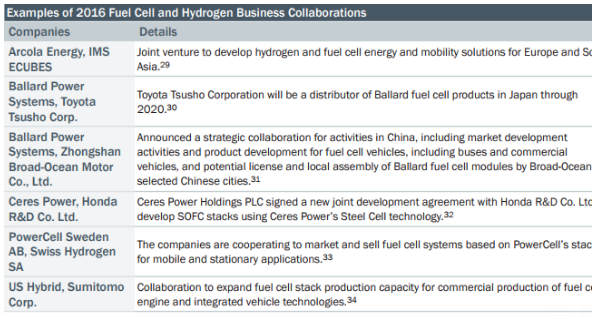 Organizations in Europe are taking a collaborative approach to continue developing the hydrogen and fuel cell industry. These collaborations are providing funding for country-specific programs, and are helping to move the programs forward. FCH JU is a public-private partnership that brings together industry, government, and research partners to accelerate the market introduction of fuel cell technology. This collaboration supports the large scale validation of fuel cell bus fleets. FCH JU will fund a set of fleets amounting to 140 fuel cell powered buses, in several locations, with a minimum of 10 to 20 buses in each depot. Cooperation on this level will allow for a high level of standardization, leading to volume cost reductions. Work with and provide recommendations to key stakeholders, such as policy makers, the business community, international agencies and civil society. Ballard is a supporting member of the Council. 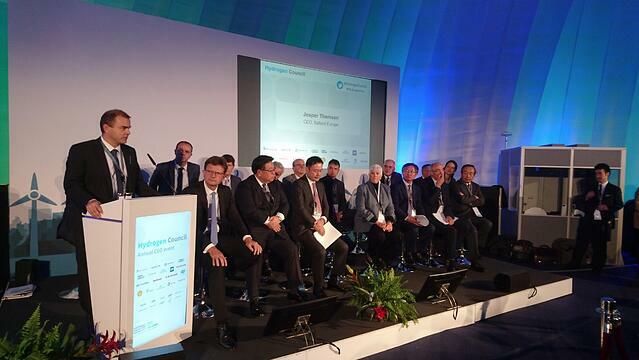 The strong leadership and coordination of the Hydrogen Council will play a significant role in promoting the commercialization and large-scale adoption of hydrogen fuel cell products for motive applications. In addition to the projects outlined in the table above, Ballard is currently collaborating with Audi to design and manufacture next-generation fuel cell technology. Ballard is also working with Nisshinbo Holdings, an environmental and energy company, to develop a non-precious metal catalyst (NPMC) for use in the world’s first commercialized NPMC-based proton-exchange membrane (PEM) fuel cell product. Strategic partnerships and collaborations are already making a huge impact in continuing to advance zero-emission technologies. And we can only go forward from here. The fuel cell industry is moving toward a critical junction in industry development. We require strong, ongoing industry collaboration throughout the value chain and ecosystem. This will drive holistic solutions, high performance, and compelling economic value propositions that support decarbonization and improved air quality.